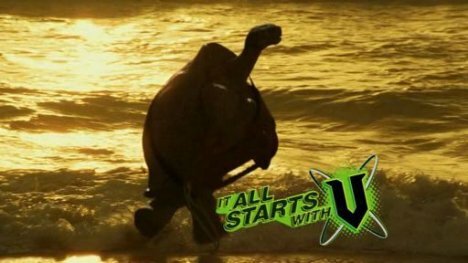 V Energy Drink, the Frucor product produced in New Zealand and Australia, and available in the UK and Netherlands, is getting a boost with the appearance of a Galapagos tortoise cruising the beaches and taking on the surf, a member of the Surf Life Saving Club. 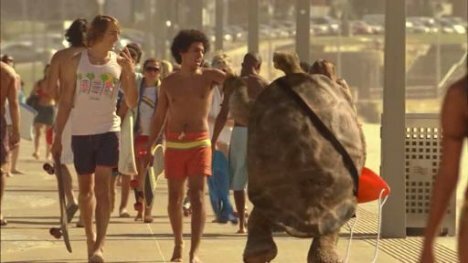 The spot clearly takes its lead from Baywatch, with the tortoise taking the role from David Hasselhoff. “Running free, you know you’re the best you can be, cause you are the hero!” It all starts with V dude! The Tortoise campaign was developed at Clemenger BBDO, Sydney, by executive creative director Richard Maddox, copywriter Alex Derwin, art director Heather Sheen, agency producers Rebekah Lawson and Jo Howlett. Filming was shot by Josh Frizzell via 8 Commercials with executive producer Mike Vanderfield and producer Annie Schutt. 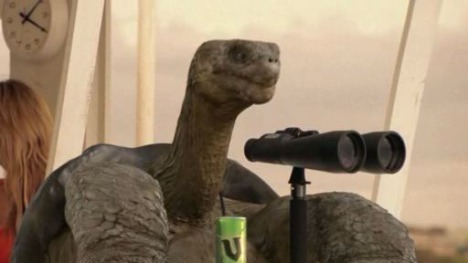 Director Josh Frizzell opted for an actor over a puppet or prosthetic to provide in-camera performance and interaction reference for the tortoise. An all-weather, life-size ‘shell-suit’ was built for the actor who endured the unfortunate discomfort of having their legs forced apart inside the suit so they would move with a tortoise-like, tottering gait. VFX were developed at Fuel, Sydney, supervised by Simon Maddison and produced by Dave Kelly. “He had to run across sand and dive through waves in that thing – it was a great performance that was really invaluable for all in post. For us in visual effects, the shadows, sand and water interaction were key aspects of filming with the suit,” explains Fuel VFX Supervisor Simon Maddison. The experienced Fuel CG character pipeline then built, animated and composited the CG tortoise into the shots, creating additional CG elements such as water running over the tortoise, as required. Original music was composed and recorded at Nylon Studios, Sydney.